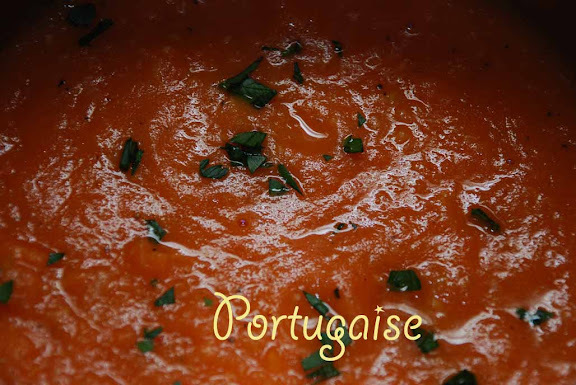 Portugaise is a classic sauce of onions cooked in fat (such as butter or oil) with tomato concassées, tomato sauce, garlic, and chopped parsley. I used the tomato sauce recipe in the Le Cordon Bleu Complete Cooking Techniques cookbook. The tomato concassée was my starting point. Then, I sweated some garlic, onions, and carrots. A dash of sugar, salt, and pepper, and a quick purée in the food processor and voilà — Portugaise sauce. In a skillet, sweat garlic, onion, and carrot in olive oil over a moderate heat, for about 5-7 minutes. Add tomato concassée , a little sugar, and salt and pepper. Cook until soft, for about 10-15 minutes. Check the seasoning. Purée. Sprinkle with fresh parsley. A fresh tomato-y sauce with just enough garlic to give it some punch.